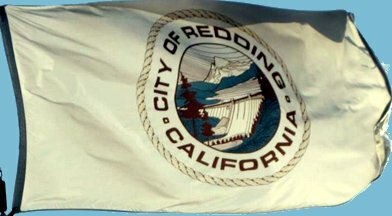 The flag for the city of Redding in front of the Redding city hall. "Redding is a city in Northern California. It is the county seat of Shasta County, California, USA. As of the 2000 census, the city had a total population of 80,865 and has grown to approximately 108,741 due to recent annexations. The flag is the city seal on a white rectangle. The dark stripe at the hoist is just reinforcement for the grommets. The picture on the seal consists of Shasta Dam and Shasta Lake in the foreground with Mount Shasta in the background. Shasta Lake is a man-made lake formed by Shasta Dam on the Sacramento River and provides water for electricity generation and irrigation. The lake is also used for recreational purposes. Mount Shasta is the second highest volcanic peak of the Cascade Range at 14,179 feet (4,322 m) and has facilities for winter sports. A KRCR News Channel item shows a local flag expert holding the flag, where it appears to be light blue.